Rose Gold PVD Weiqin Watch below is a beautiful and trendy Ladies watch . 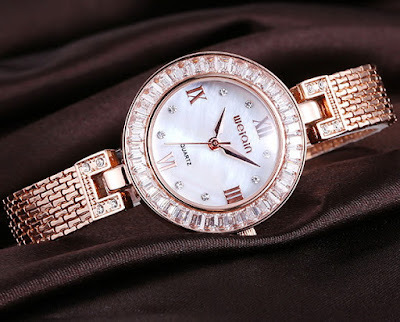 Case is made out of PVD rose plating while the dial colour is pure white. The rectangle CZ stone setting full around the bezel. And a matching mesh band makes us shiny and fashionable. The watch is shipped with a watch box and a guarantee from us.